Voyager 1 is an interplanetary space probe launched on September 5, 1977, which flew past Jupiter (March 5, 1979) and Saturn (November 12, 1980). It is now one of five probes, including Pioneer 10, Pioneer 11, Voyager 2, and New Horizons that are heading out of the Solar System. Voyager 1 became the most remote human-made object when, in mid-1998, it surpassed the heliocentric distance of Pioneer 10. On August 15, 2006, Voyager 1 passed another milestone when it reached 100 astronomical units (15 billion kilometers, 9.3 billion miles) from the Sun, equivalent to a round-trip light-travel time of 27 hours 52 minutes. 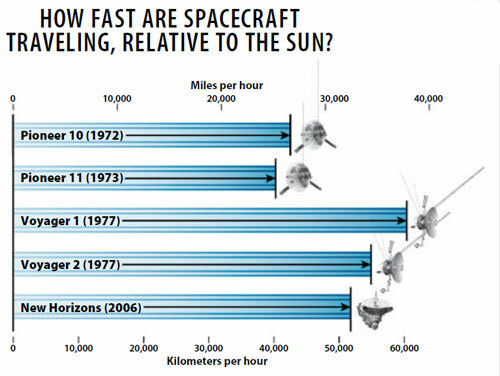 It is traveling at a velocity of 17.23 kilometers per second (38,551 mph) away from the Sun – the fastest of the interstellar spacecraft – in the general direction of the solar apex (the direction of the Sun's motion relative to nearby stars), so that it will probably be the first of the four present star-bound craft to reach the termination shock and cross the heliopause into true interstellar space. Thereafter, it will have a journey lasting almost 40,000 years before it passes the M4 red dwarf AC +79° 3888 at the remote distance of 1.64 light-years (0.50 parsec). In December 2010, it was reported that the Low-Energy Charged Particle Instrument aboard Voyager 1 had detected a change in the direction of the flow of particles in the solar wind. The particles were no longer traveling radially outward from the Sun but were moving sideways, down the tail of the heliosphere. This is a consequence of the solar wind pushing up against the material of interstellar space. Voyager 1 is thus very close to boundary with interstellar space and is likely to cross over to the space between the stars within teh next five years. Toward the end of July 2012, two of the three signs of change expected as Voyager 1 reached the edge of interstellar space began to change faster than ever before. On July 28, data from Voyager 1's cosmic ray instrument showed the level of high-energy cosmic rays originating from outside the Solar System rose five percent. During the second half of the same day, the level of lower-energy particles originating from inside the Solar System fell by half. Voyager 1 is about 18 billion kilometers (11 billion miles or about 0.002 light-year).